The US compromise will be likely to please nobody. After sustained pressure from human rights groups, democracy advocates in Congress, and some within the Obama administration who were worried (rightly) that Obama touting Malaysia as a model democracy might be slightly compromised by the pending sham charges against Malaysia’s opposition leader, now it appears that National Security Advisor Susan Rice will meet Anwar Ibrahim during the president’s visit to Malaysia this coming weekend. AFP and ChannelNewsAsia have a summary of the most recent news on Obama’s upcoming visit to Malaysia here. Although this means that Rice, the second-highest ranking American official on Obama’s trip, will meet with the Malaysian opposition leader, the decision, I think, will please no one in Malaysia. 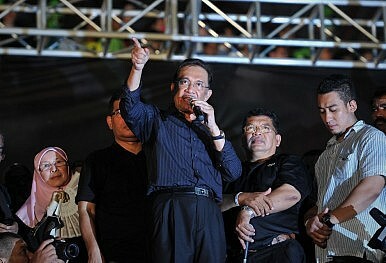 Although Anwar has taken a relatively low-key approach to the Obama visit, simply expressing displeasure that Obama would not meet with him, supporters of the People’s Justice Party (PKR), the opposition alliance, are furious that Obama had planned to come to Malaysia and barely even note the presence of a healthy opposition. Now, I doubt many PKR supporters will be mollified by the Rice meeting, which seems like such a last-minute addition, an afterthought to Obama’s agenda. Yet at the same time, Prime Minister Najib, who enjoys excellent personal ties with Obama himself, has pushed hard for the president not to recognize the Malaysian opposition at all. Now, Najib and his allies in Washington who argue that the prime minister’s feelings are so delicate that any recognition of the opposition would damage the U.S.-Malaysian strategic relationship, are likely to be angered by the Rice meeting—angered as much as they would have been if Obama himself met with Anwar or another opposition leader. Of course, if Malaysia is such a democratic model, then it should hardly matter to Najib whether a visiting leader meets with members of the loyal opposition, but that is precisely the point: Malaysia is hardly a democratic model. In any event, expect the Rice meeting to generate furious commentary from Najib’s proxies in Malaysia’s state media. So, in this case, Obama’s half-measures probably will earn him full discontent from all sides in Malaysia. Obama in Malaysia: A Strategic Partnership?What Does Malaysia’s Earthquake Election Mean for Democracy in Southeast Asia?Malaysia’s Election Will Test the Country’s StabilityWhy Boycotting Malaysia’s Election Makes SenseCan the New Mahathir-Anwar Alliance Defeat Najib in Malaysia’s Election?